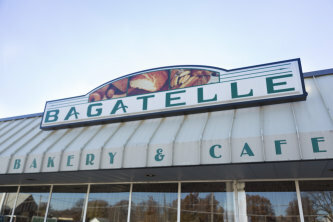 Bagatelle Bakery is family owned and operated. Shortly after their marriage, Naji and Claire Toubia teamed up with influential restaurateur Antoine Toubia to open Bagatelle Bakery in 1983. Our mission has always been to give our community the pleasures of the European bakery experience that the Toubia family adored growing up abroad. We are a scratch bakery, meaning we have complete control over all ingredients. Bagatelle bakes every day, including Sunday, to provide our community with the freshest baked goods. We choose not to add any preservatives or additives typically used in the baking industry. We also choose not to charge the high prices typically offered by local specialty bakeries that make the European bakery experience inaccessible to many. We are a well-rounded bakery and café with a rich variety. Our exquisite, artistic chantilly cream cakes can be decorated for any occasion from birthdays to weddings. Our artisan breads are made with local ingredients and hand-crafted using techniques that have stood the test of time. Our hand-rolled croissants are layered with real butter to provide the perfect blend of buttery flavor and flaky texture. Our café features a fast-casual atmosphere and a menu created by a classically trained chef, our owner Naji Toubia.